After connecting your Facebook Ads, Google Ads, and LinkedIn Ads accounts to HubSpot, you can view, manage, and analyze your ad campaigns in HubSpot's ads tool. The ads dashboard displays all your existing ad campaigns in your connected ads accounts. In the upper left, use the filters to filter data by accounts, attribution report, date range, or campaign status. Selecting different attribution reports will only change the Contacts metric, and metrics that are directly affected by the number of contacts (e.g., Customers and Cost per contact). Contacts may show up in multiple attribution reports, and some overlap is expected between the different attribution reports. Learn more about ads attribution in HubSpot. 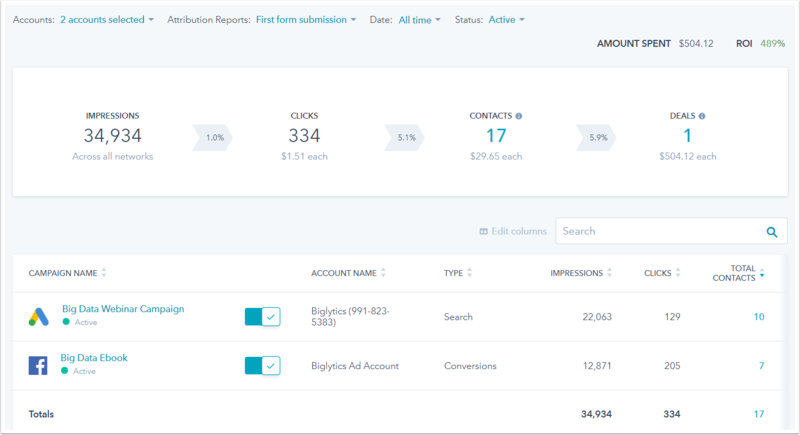 The first report shows the impressions, clicks, leads, number of new contacts, and deals generated from your selected ad campaigns. The table shows the following campaign metrics: campaign name, account name, type, impressions, clicks, total contacts, customers, MQLs, cost per contact, amount spent, ROI, and revenue. Click a column header to sort campaigns by a specific metric, and click a campaign name to drill down into a specific campaign's metrics. The Spend amount comes directly from the associated network (Facebook, Google, or LinkedIn), while the ROI is calculated by HubSpot. The Cost per contact metric is calculated by dividing the cost of the ad with the number of new HubSpot contacts attributed to that ad. Total contacts, cost per contact, Customers, Leads, Marketing qualified leads, Sales qualified leads, and Opportunities are HubSpot-specific metrics, and are not visible to external ad platforms. It's not recommended to compare these metrics to metrics in other ad platforms, as the platforms cannot calculate them without visibility into your HubSpot account. Learn more about comparing data in HubSpot ads with external ad networks. It's recommended to match your time zone in your HubSpot account and your external ad platforms to avoid discrepancies between metrics such as ad spend. If you have a Google Ads search campaign in HubSpot, you can view a list of keywords associated with each ad group along with their performance. Click the name of an ad group. In the upper left of the table, click the Ads dropdown menu and select Keywords.